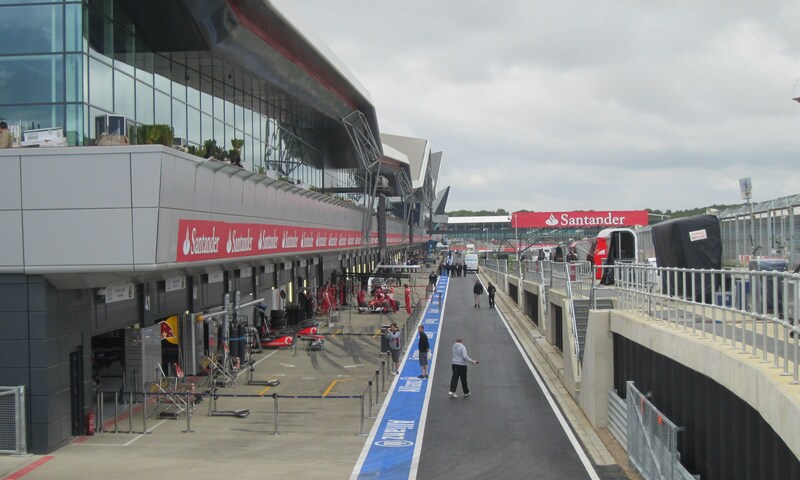 The garages of the top F1 teams have been moved to the middle of the pit lane for the British GP, so that fans will be able to see them. At the first race with the new Silverstone pit complex last season the garages of Red Bull, McLaren, Ferrari and to some extent Mercedes disappeared into the unusual ‘railway cutting’ at the far end of the pitlane, and could not be seen from the spectator area opposite. An additional concern for RBR was that the last garage was so close to the white line marking the pit exit that its drivers were not able to accelerate up to the speed limit before crossing it, which created a small disadvantage at each stop. The allocation, which is decided by FOM rather than the FIA, has been changed for this year. However on a one-off basis instead of the World Champions being at one end and the remaining teams laid out in 2011 championship order, the top teams have been put in the middle, and the rest spread out on either side. “The pit lane is a little bit unusual,” McLaren’s Martin Whitmarsh told this blog. “Last year some of us enjoyed no view of the stands, and consequently presumably they enjoyed no view of us. It’s easy after the event to be critical of that. But this year we will have a different garage allocation, and we’ll see a bit of sun in our garage. For “a little bit unusual” read extremely badly designed. I have not been to Silverstone since the ‘wing’ was built, but for what I hear, it has several fairly major design faults. What a shame, not to mention a waste of money. We were at Silverstone last year on and the wing does look fantastic but the teams we realy wanted to see in the pitlane were hidden away from view. Hopefully those with tickets this year will have a better view thanks to them being moved to the middle. Such a shame that Silverston had all that purpose built and didn’t into consideration the view the fans would have. I was at Silverstone last year – lucky enough to get a grandstand ticket right opposite the McLaren pits up as high as we could go and couldn’t see a thing except their Pit Wall boxes. The roof looks like something I snowboard on but it’s fine to look at. The pit wall is terrible design though! I like the design of the building but the idea of the sloping pit lane is not a great one. Probably cost a fair amount to ‘fix’ or change now. A shame. Also think they should have just reversed the order. What a shame that it has such a stupid design fault… such a wonderfully dramatic building otherwise.